Here at Austin Gutterman, we want you to know that preventing water problems costs much, much less than the cost of repairing issues related to rainfall. That is why we recommend seamless rain gutters Austin can rely on for decades to come. When you consider the cost of a reliable gutter system over time, there’s no comparison in cost-benefit analysis. And while you may be able to find a cheaper alternative on the market, you’re likely to get a product that will ultimately contribute to the deterioration of your most valuable asset… your home. 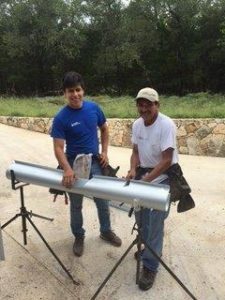 It is important to consider the advantages that come with a set of seamless rain gutters, Austin. One of those advantages is that seamless gutters require less maintenance than sectional gutters. Gutters with joints are often prone to the accumulation of debris. Items like leaves, twigs, and other such detritus accumulate in the gutters and can clog them. Of course, there are other problems that accompany debris. For instance, pests and birds make their way into gutters, and weeds may also work their way into walls and adjoining structures. Seamless gutters are more firmly fixed, and hence, there is no chance of clogging and debris accumulation. This all means that seamless gutters require significantly less cleaning and maintenance compared to sectional gutters. You will also find the absence of joints and seals that can erode or gather debris in seamless gutters, thus they offer far better protection to the property. Austin Gutterman would be happy to talk with you about more of the advantages inherent in a set of seamless rain gutters, Austin. Better still, we would love the opportunity to visit you and provide you with an estimate for our services. You can schedule a proposal with Austin Gutterman by calling 512-450-1821 or by visiting our website, http://www.austingutterman.com/contact/#contact-form.